Following the death of Harry S. Hathaway in 1946, the work of collecting, evaluating, and preserving evidence supporting reports of rare birds in Rhode Island was performed by the Rhode Island Ornithological Club. Seven decades is a long time, but contemporary Rhode Island birders are linked to the RIOC’s early figures, including Roland C. Clement, Henry E. Childs, Sr., William B. Dean, William H. Drury, Jr., Harold Gibbs, Alvah W. Sanborn, Charles Wood, and Carlos Wright, by a trio of talented and dedicated naturalists: Douglas L. Kraus, born 1912 and active 1924 until his death in 2000; David L. Emerson born 1924 and active 1939, or earlier, until his death in 2004; and Richard Bowen born 1922 and active 1939, or earlier, until his death in 2009. With the passage of half a century or more, it is hardly surprising that many figures from the early RIOC years lost contact with the birding community, moved away from Rhode Island, or died, but these three men remained among Rhode Island’s most active, productive, and congenial field workers through the 1990s. Emerson also made notable contributions to the permanent record of Rhode Island ornithology by painstakingly tracking bird records and updating Rhode Island’s Field Checklist over many decades. Junior to those mentioned above, but equally talented and dedicated, Richard L. Ferren connects past with present. Working closely with many of those named above, Ferren has literally written the book on Rhode Island birds, a project undertaken as early as 1956 and planned for publication this year or next. 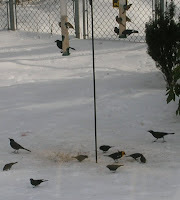 Recognizing the need for continuity as the RIOC era waned, the Rhode Island Avian Records Committee drafted and approved bylaws during two meetings in Kingston, on 8 January and 15 February 2008. These bylaws can be viewed at: <http://sites.google.com/site/riarcribirds/>. The present report describes the Committee’s evaluation of 37 reports from 2007 and earlier, involving 33 separate occurrences and 28 species. It also includes an updated Checklist of Rhode Island birds and a review list of species requiring documentation. We intend to publish future reports each year, with the second annual report expected to focus on reports from 2008 and 2009. 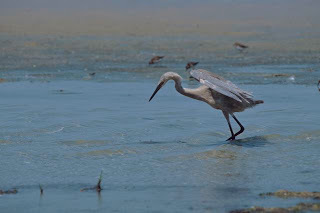 The Committee recognizes its indebtedness to the birders of Rhode Island and gratefully acknowledges their efforts in contributing written descriptions, photographs, and other kinds of information concerning unusual birds in the Ocean State. Reports are always welcome, even long after an observation. As a practical matter, however, reports prepared promptly after an observation tend to be more detailed and more reliable—and also much easier to prepare—than those assembled long after the fact. Guidelines for the preparation of reports are presented at the website cited above and are also available on the websites of many other state records committees. Common sense is the rule in this regard: a report ought to express clearly who saw the bird, where and when it was seen, exactly what features were observed, whether photographs, recordings or drawings were obtained during the observation, and how other species were ruled out during the identification process. Although the Committee welcomes reports in any kind of format, electronic files such as Microsoft Word documents and jpeg image files are the most convenient and can be sent as email attachments to Doug Wilson, Secretary of RIARC, at <secretary@ri-avianrecords.org>. Reports are grouped below by year of observation and then by whether the Committee found the available documentation acceptable after review. It is worth emphasizing that the purpose of review is to evaluate as objectively as possible the degree to which a report of an unusual occurrence is supported by documentary evidence. 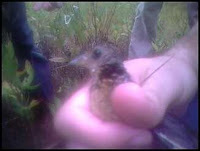 The Committee understands that many reports that are not accepted likely pertain to birds that were correctly identified; the distinction concerns the degree to which the available documentation can be used to revise or improve our understanding of the status and occurrence of bird species in Rhode Island. RIARC Number, Vote (Accepted-Not Accepted-Natural Status Uncertain), # of birds reported, location, date(s), reporters (I = initial observer, R = report submitted, P = photograph submitted). 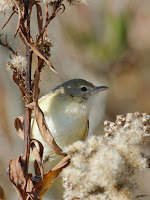 This Greenland-breeding species represents an addition to the Rhode Island avifauna. Occurring with flocks of wild Canada Geese that also included multiple “Richardson’s” Cackling Geese, these birds showed no signs of captive origins and were closely studied by scores of observers. Coincident with a major population expansion (Mitchell and Hearn 2004), Pink-footed Geese have been occurring with accelerating frequency in northeastern North America (Wilson et al. 2009). 2007-23 (7-0) One; Middletown; 13-Jan-07 to 28-Jan-07; Dan Finizia (I) & Sue Talbot (I, P), Shaibal Mitra (R,P), Marshall Iliff (P). Like the preceding species, this Greenland-breeding goose has been occurring more frequently in northeastern North America in recent years, in contexts indicative of natural vagrancy. Unlike Pink-footed Goose, the present species is very popular in captive waterfowl collections, and older records tended to be treated with considerable skepticism. In the absence of any evidence suggestive of captive origins, and in view of the emerging trend toward regular occurrence in our region, the Committee voted unanimously to accept the present record. The 2002 edition of the Checklist of Rhode Island Birds lists five records from 1989-2002. 2007-24-A,B (7-0) Six; Newport/Middletown; 7-Jan-07 to 23-Jan-07; Shaibal Mitra (R,P), Marshall Iliff (R,P), James Smith (R,P). Following the American Ornithologists’ Union’s split of Canada Goose into two species (Banks et al. 2004), interest in the extralimital occurrence of the various taxa greatly increased. Previously, birds described as “small forms” of Canada Goose were occasionally reported in Rhode Island, but mostly without much documentary evidence or critical attention to subspecies identity. The present birds were carefully scrutinized during January 2007’s Aquidneck Island goose chases and confirmed as Branta h. hutchinsii, long known as “Richardson’s Goose” and now properly referred to as “Richardson’s” Cackling Goose. 2007-16 (7-0) One; Mud Pond, South Kingstown; 26-Dec-07; Bill Heck (I), Hank Golet (P). 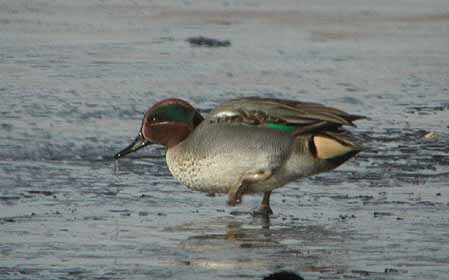 The distinctive nominate subspecies of Green-winged Teal has been recorded on more than a dozen occasions in Rhode Island, including at least twice before at nearby Cards Pond (29-Mar-48 and 30-Apr-89: Ferren, in litt.). Reports of this form deserve careful documentation, as provided in the present case, to rule out obvious signs of hybridization with the locally prevalent subspecies carolinensis. 2007-18 (6-1) One; near Old Harbor, Block Island; 2-Oct-07 to 6-Oct-07; Hugh Willoughby (R), Sue Talbot (P), Dan Finizia (P). Regular in Massachusetts in recent years, this vagrant from western North America has occurred frequently enough in Rhode Island over the years to warrant placement in the main body of the Rhode Island Ornithological Club’s 2002 Checklist, rather than among the rarest vagrants on the back of the card. Even so, the non-breeding plumages present a genuine identification challenge and all reports deserve detailed documentation. Photos of the present bird were deemed adequate by the Committee to rule out the very similar Arctic Loon, a bird only tenuously known from eastern North America. 2007-2 (7-0) One; Arnold’s Mills Reservoir, Cumberland; 2-Sep-07 to 8-Sep-07 Mark Lynch (I,R). This stellar find by Mark Lynch was about the seventh record for the state and much the farthest from the outer coast. 2007-13 (7-0) One; Succotash Marsh, Narragansett; 19-Oct-07; Zack Sevarino (I), Rebecca Raymond (P), Christian Nunes (R). Although probably occurring much more regularly than sight observations suggest, this species is notoriously difficult to detect. Its actual status might be inferred somewhat better through the dozen plus records of birds taken by experienced shooters using trained dogs, both during the early 20th Century (more than a dozen records 1908-1912), and more recently by Bob Saunders (three collected fall 1970). 2007-15 (7-0) One; Mud Pond, Trustom Pond NWR, South Kingstown; 6-Dec-07 to 29-Feb-08, Dot & Bruce Kindseth (I,R), Andy Boyce (R), Paul L’Etoile (P). 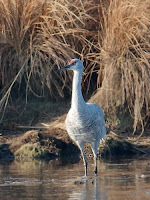 Formerly an exceptional vagrant to our region, Sandhill Cranes have increased greatly in the Northeast in all seasons and now breed regularly in New York State and northern New England. Photo by Paul L'Etoile . 2007-28 (7-0) One; Napatree Point, Westerly; 31-May-07, Chris Raithel (I,R), Richard Ferren (I). Seen by two of the state’s most experienced field ornithologists and described in detail, this observation provides welcome documentation for a species whose occurrence in the Northeast might be declining. 2007-6 (7-0) One; Briggs Marsh, Little Compton; 7-Dec-07 to 8-Dec-07; Robert Emerson (I,R), Shaibal Mitra (R,P), Geoff Dennis (P), Paul L’Etoile (P). 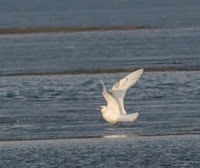 Just the second record for Rhode Island and the first seen by multiple observers, this first winter Ivory Gull was one of the most unexpected birds of 2007. 2007-5 (7-0) One; Sachuest Marsh, Middletown; 9-Sep-07 to 16-Sep-07; Rey Larsen (I,R,P), Paul L’Etoile (P). Like Ruff, this species has been reported very sparingly from Rhode Island in recent years, so this cooperative and attractive juvenile provided welcome documentation. Photo by Rey Larsen . 2007-10 (7-0) One; Quicksand Pond Beach, Little Compton; 17-Apr-07; Geoff Dennis (I,R,P), Chris Raithel (P). The extraordinary northeast storm of 15-Apr-2007 produced a seasonally unprecedented series of Sooty Terns in RI, CT, and Long Island, as well as a major fall-out of Neotropical migrant landbirds. The present record of Sooty Tern is supported by a bird found dead on the beach and prepared as a specimen for the American Museum of Natural History, and others were convincingly reported (although without details provided to the Committee) from Pt. Judith. 2007-3 (7-0) Two; Pelagic, Mud Hole; 24-May-07; Scott Tsagarakis (R), Carlos Pedro (P), Paul L’Etoile (P). Superbly photographed, these birds were readily identifiable to species. 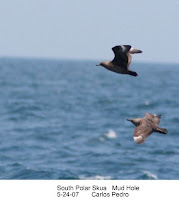 South Polar Skua is the expected skua species in our region during the warmer months, but the status of Great Skua is not well understood, and other taxa breeding in the Southern Hemisphere are remotely possible. 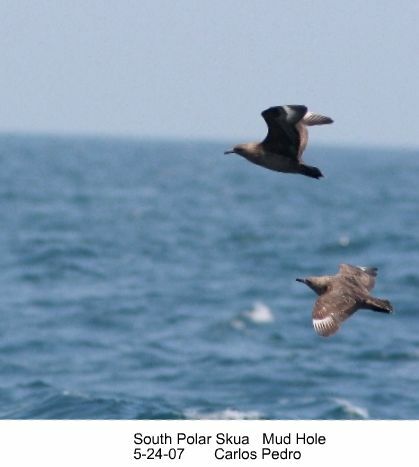 We encourage observers to study all skuas they encounter in Rhode Island waters as critically as possible. 2007-20 (6-1) One; Camp Cronin, Narragansett; 9-Oct-07; Phil Budlong (R), Linda Gardrel (R), Mary Jo Murray (R). Although Western Kingbird occurs regularly in the Northeast, RI records have been scarce and several similar-looking species have been documented in the Northeast in recent years (Tropical and Couch’s Kingbirds in MA and Cassin’s Kingbird in NY). Thus we appreciate the details submitted in support of the current report. The dissenting vote reflected one member’s concerns that the level of detail provided was less than ideal. Overall, however, the Committee recognized that these reports were compiled after the fact in response to the Committee’s appeals for documentation, and the information provided was adequate to rule out other species. 2007-22 (7-0) One; Sachuest Point NWR, Middletown; 24-Nov-07 thru 1-Dec-07; Patty O’Neill (I,R), Shaibal Mitra (R), Paul L’Etoile (P), Carlos Pedro (P). Patty O’Neill added another one to the Rhode Island list (it hardly feels like fifteen years have passed since she stunned New England with her Black-tailed Gull) when she discerned that this drab green little bird wasn’t just an Orange-crowned Warbler and got the word out to the birding community. Beautifully photographed by Paul L’Etoile and Carlos Pedro, this bird was seen by many during its week-long stay. 2007-25-A,B (7-0) Ten, South Coast of RI; 8-Nov-07; Pete Capobianco (R), Paul L’Etoile (P). 2007-9 (7-0) Three; Watch Hill Light, Westerly; 24-Nov-07; Glenn Williams (I,R). 2007-26 (7-0) Four; Westerly; 10-Nov-07; Marshall Iliff (I,R,P). Less than a decade after Rhode Island’s first records in 1998, Cave Swallows are establishing a predictable pattern of November occurrence in the Ocean State, as well as in the surrounding region. For now, the Committee still seeks documentation for all Cave Swallow reports, in order to clarify arrival and departure dates and to determine whether Cliff Swallow might occasionally co-occur as a very rare late fall vagrant. 2007-4 (7-0) One; Durfee Hill Mgt. Area, Glocester; 18-Aug-07 to 21-Aug-07; Charles Brown (I), Chris Raithel (R). Formerly a regular fall migrant in Rhode Island, this species has been confidently reported just a dozen or so times since 1968. The present detailed description of an apparently territorial bird is especially noteworthy because several historical reports of breeding in Rhode Island are open to doubt (Ferren, in litt.). A more recent report of breeding from 2005 is currently under review. 2007-11 (7-0) One; Easton’s Pond, Newport; 31-May-07; Charles Avenengo (I,R), Robert Weaver (R,P). Approximately the sixth record for Rhode Island, this represents the first spring occurrence for the state. 2007-1 (7-0) One; 22-Dec-07; West Kingston; Shaibal Mitra (I,R). Although Bohemian Waxwings occur regularly in northern New England, sometimes in large numbers, this species’ status in Rhode Island for years was based on just a few sight reports accompanied by scanty details. The present record involves a bird seen by two participants in the South Kingstown Christmas Bird Count and includes a detailed description. 2007-8 (7-0) One; Avondale Preserve, Westerly; 21-Nov-07; Phil Rusch (R). 2007-17 (7-0) One; West Warwick; 18-Mar-07; Robert Touhill (I,R,P). 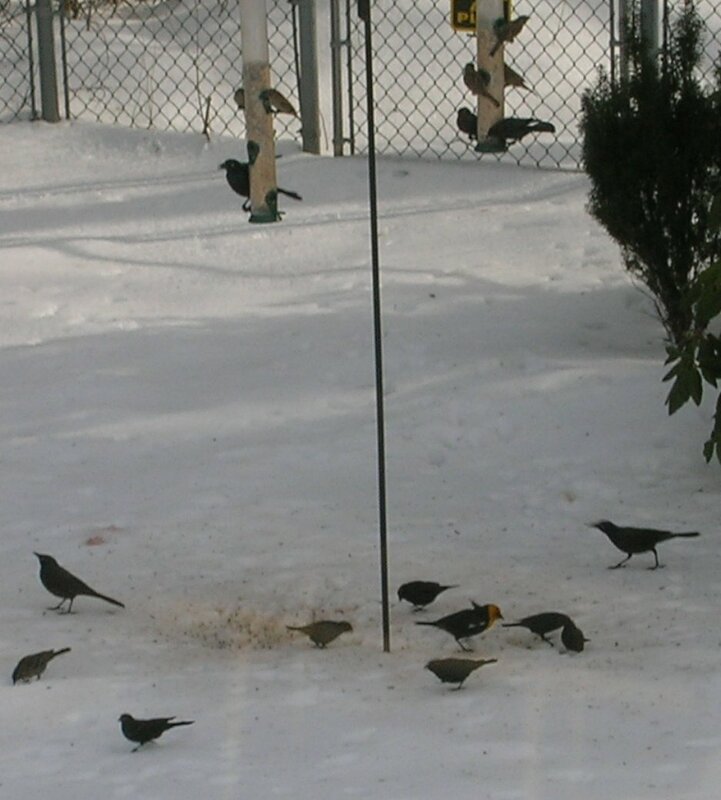 Although Yellow-headed Blackbirds occur regularly in the Northeast, Rhode Island records are relatively few and the Committee appreciates the documentation provided in support of the present records. 2007-19 (6-1) One; Diamond Hill Reservoir, Cumberland; 2-Dec-07; Mark Lynch (I,R). Formerly occurring in flights about once per decade in Rhode Island, Pine Grosbeaks have been virtually absent from the Ocean State since 1978. The present record involves a bird briefly seen and heard by an experienced observer at a site notable as the location of one of the largest flocks of Pine Grosbeaks ever recorded in the state (1-Feb-47). The reports summarized here did not, in the judgment of the Committee, include adequate evidence to be accepted as fully documented records. This certainly does not imply that these reports are erroneous, and in the present context, all of the reports listed here received support from one or more Committee member. Many non-accepted reports involve very brief encounters by single observers, in which circumstances precluded the acquisition of the kinds of evidence useful for substantiating a rare event. It is important to emphasize that these reports will not be discarded. They will be preserved in the Committee’s archives and can be re-evaluated in the light of additional evidence or knowledge in the future. 2007-7 (1-6) One; Andy’s Way, Block Island; 22-Sep-07. Distinguishing Pacific and American Golden-Plovers is exceedingly difficult even where both species might be expected. In the eastern United States, however, where Pacific Golden-Plover is known from just a handful of documented records, the standard for acceptance must be set very high. This description from a single observer was suggestive of Pacific Golden-Plover in several respects, perhaps most notably in terms of facial color and pattern. Notably, calls were heard (rendered as “Too-Le-Uh”) and described as “stated or strongly stated, not vibrant and urgent.” To at least some on the Committee, this description seemed at least as apt for American as for Pacific, and in the absence of photographs or a critical analysis of plumage and structure (e.g., primary projection), the identification was deemed uncertain by six members. 2007-27 (4-3) One; Briggs Marsh, Little Compton; 6-Dec-07. This single-observer report involved a brief view of a swallow in flight, in which only the undersides of the bird were seen. 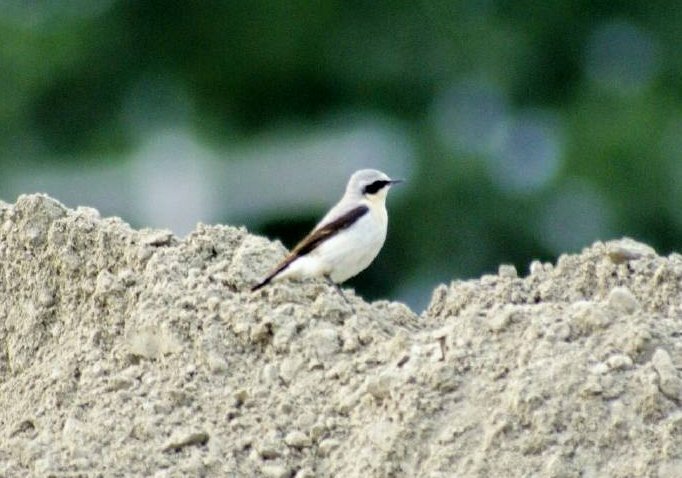 While acknowledging the likelihood that this may have been a Cave Swallow, several members preferred a greater level of detail than was possible in this instance in order to fully document what would be a record-late date for Cave Swallow in the state. 2007-12 (4-3) One; North Kingstown; 14-May-07. This report was based on the observation of a single observer of a bird seen briefly in flight. The Committee fully understands the difficulty of recording critical details under such circumstances, and the reviews uniformly praised this report for its candidness and sincere acknowledgment of its limitations. In many ways, reports of this kind are particularly difficult to evaluate; the members who voted to accept all expressed at least some reservations, and those who voted not to accept all expressed the idea that they believed the identification was likely correct. Ultimately, there simply was not enough detail to warrant acceptance. 2007-14 (3-4) One; Seapowet, Tiverton; 18-Dec-07. Seen briefly but well by two observers, this blackbird was described as an adult female Brewer’s Blackbird, mostly on the basis of its dark iris. Again, the Committee expressed support for the identification along with frustration concerning the lack of critical detail—e.g., concerning bill shape, tail length, and posture. The circumstances of the observation did not allow for photography, and the Committee wishes to emphasize that the report in question was generously provided at our request, long after the fact, by one of the observers. In other words, this report was not prepared as formal documentation at the time of the observation, and it is certain that many details observed in life were not preserved. Given the genuine rarity of this species in our region and the difficulty of distinguishing it from variant Rusty Blackbirds (or even Shiny Cowbirds, which have been documented in Maine and Nova Scotia), the Committee deemed it best not to accept this report. 2006-2 (7-0) One; Walker Farm, Barrington; 8-Oct-06; Sue Talbot (I), Dan Finizia (I,R,P), Scott Tsagarakis (R). Nicely photographed and carefully described, this Virginia’s Warbler constitutes a first state record for Rhode Island, and one of very few for the Northeast. 2006-3 (7-0) One; Watchemoket Cove, East Providence; 6-Jan-06 to 11-Feb-06; Carlos Pedro (I,P), Shaibal Mitra (R,P), Paul L’Etoile (P), James Smith (P). Mew Gulls have been reported several times from Rhode Island, but remarkably, the species was never fully documented here prior to Carlos Pedro’s discovery of this cooperative and long-staying individual. 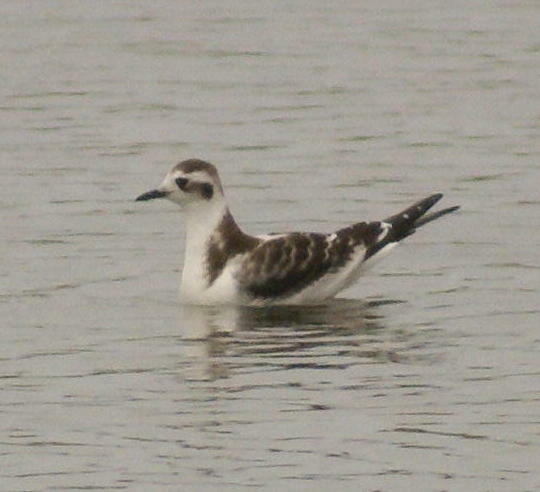 Ironically, this bird probably pertained neither to the nominate, European subspecies, which has furnished many records in nearby Massachusetts and a few on Long Island, nor to the western North American subspecies brachyrhynchus, which has occurred a number of times in the Great Lakes region, but rather to the Siberian subspecies kamschatschensis. In our reviews, the Committee did not address the question of subspecies, but we may do so in the future, pending publication of a critical analysis (Mitra et al., in prep.). 2005-3 (7-0) One; South Kingstown; 26-Dec-05; Christian Nunes (I,R). One of the most astonishing Christmas Bird Count discoveries ever in Rhode Island, this Redwing was studied in detail, heard singing, sketched, and carefully described by Christian Nunes, barely a mile from where he grew up! Unfortunately, the bird was never found again after the initial encounter, despite considerable effort. This first state record was studied by many observers and nicely photographed. Although its species identity was not an issue, questions arose concerning how many individuals were involved. Not only the physical appearance but also the dates of occurrence pointed strongly to a single individual that moved between Charlestown, Little Compton, and Westport, MA (Rines 2005). Banks, R. C., C. Cicero, J. L. Dunn, A. W. Kratter, P. C. Rasmussen, J. V. Remsen, J. D. Rising and D. F. Stotz. 2004. Forty-fifth Supplement to the American Ornithologists’ Union Check-list of North American Birds. Auk 121: 985-995. Mitchell, C. and R. D. Hearn. 2004. Pink-footed Goose Anser brachyrhynchus (Greenland/Iceland population) in Britain and Ireland 1960/61-1999/2000. Waterbird Review Series, The Wildfowl & Wetlands Trust/Joint Nature Conservation Committee, Slimbridge, England. Rines, M. 2005. Ninth Annual Report of the Massachusetts Avian Records Committee. Bird Observer 33: 86-91. Wilson, A., J. Skelly, J. S. Bolsinger, T. W. Burke, W. D’Anna, A. Guthrie, S. S. Mitra, and D. Sherony. 2009. The report of the New York State Avian Records Committee (NYSARC) for 2007. The Kingbird 59: 306-332.